The Skinny: Painfully unfunny Wong Jing wuxia featuring an all-star cast who uniformly deserve better. Michelle Yeoh and Maggie Cheung may be the big attractions, but they're overwhelmed by the assault of tasteless and tiresome comedy. At times visually arresting, this Wong Jing wuxia is otherwise tacky, obnoxious, and guilty of relentless assault on your sense of humor. Simon Yam is the evil Super Sword, who wreaks havoc with his "sword form." 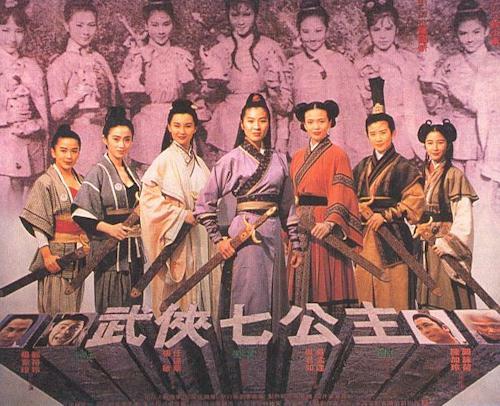 Against him are Michelle Yeoh and six other comely females who must join together to defeat him when Heaven's Sword (Damian Lau) becomes incapacitated. Adding to the inanity is the fact that all seven women must be virgins, which accounts for about 60% of the film's humor. The other 40% is your standard crap involving mistaken identity, horny characters, crossdressing, musical numbers, and the comedy stylings of Dicky Cheung. Ng Man-Tat is the Ghost Doctor, and it's one of his more typically annoying performances. For every good gag in this flick there are about ten others that fall flat. This is extremely typical of Wong Jing's work at the time and the pain the film causes could prove fatal.